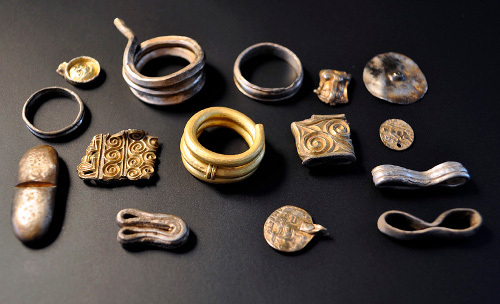 DANEMARK – Roskilde - A few weeks ago my friend Tobias Bondesson and his fellow amateur detectorists Iohannes M. Sundberg and Tommy Olesen found a 3.5 kg silver and gold hoard from the 5th century AD near Roskilde in Denmark. 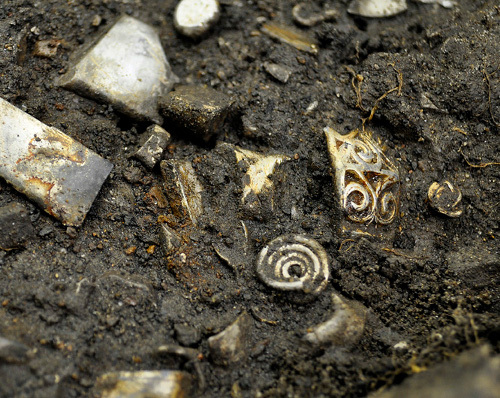 They reported their find to the town museum, the hoard was lifted by experts and excavations are ongoing. This closed find, consisting of ~1500 pieces of metal and the pot in which they were buried, is of immense value to archaeology and numismatics thanks to the snapshot of coeval objects it gives us. This not just bullion: many of the objects are typologically distinct. I’d love to help identify all the bits! ROYAUME UNI – Coventry - A city centre archeological dig has unearthed historic clay pottery which has been buried for centuries. A range of 17th and 18th century pottery has been uncovered by the Coventry And District Archaeological Society during the four-day dig in Gosford Street this week. Similar archeological work at the site at the back of Gosford Books in 2004 uncovered artefacts dating back to medieval times. BULGARIE – Sozopol - Archaeological digs in the Bulgarian town of Sozopol on the Black Sea – where earlier this summer archaeologists found a skeleton staked post-mortem to prevent the deceased from rising as a vampire – have yielded another unusual find in the skeleton of a man that appears to have been such an inveterate gambler that he took his knucklebones to the grave. The skeleton has been provisionally dated to the fifth century BCE. As part of the funeral rites, the deceased was buried with a Greek dish that had 80 astragaloi – roughly cubic-shaped ship ankle bones used for gambling in the ancient times, Bulgarian daily Pressa reported. The use of astragaloi for gambling in ancient Greece is well-established by pottery depicting Ajax and Achilles playing a version of backgammon, such as the Exekias amphora of the Vatican museum. The skeleton was found in a classical-era necropolis under the St Nicholas church in Sozopol. Other skeletons found as part of the digs include that of a pregnant woman and, separately, that of a Christian girl, dating to the sixth century CE, the report said. Sozopol is one of Bulgaria’s oldest towns, the current settlement dating back to the seventh century BCE when it was founded as a Greek colony named Antheia (the town’s name would later change to Apollonia and then Sozopolois), but it appears that the site was inhabited as far back as the second millennium BCE, which makes it a rich digging ground for archaeologists every summer. SRI LANKA – Talawakelle - Sri Lanka Department of Archaeology has commenced studies on an ancient tunnel recently discovered in the central hill country. The entrance to the tunnel was discovered accidentally as the earth was being removed using earth moving machinery for a construction. The tunnel is situated near Bearwell Estate in the Lindula police area of Talawakelle in Nuwara Eliya district. Nuwara Eliya District Secretary D.P.G. Kumarasiri has visited the site. The tunnel is 10 feet tall and expands to three sides from the middle according to the official. The area has been declared as a restricted entry area and the studies have been started. There are several archaeological protected sites in the Nuwara Eliya district. According to legend, the devil King Ravana has fought the forces of Indian king Rama in the Ramboda area of the district. ROYAUME UNI – Bannockburn - Archaeologists launched a bid to uncover the site one of the most famous battles in Scottish history -- in the grounds of a police headquarters. Central Scotland Police's headquarters at Randolphfield, Stirling, is named after Sir Thomas Randolph, one of the commanders of Robert the Bruce's army at the Battle of Bannockburn in 1314. The first major skirmish of the two-day battle occurred on Sunday 23 June when Randolph routed around 300 English cavalry, who were attempting to relieve Stirling Castle. A pair of small standing stones near the entrance to the current police headquarters is believed to mark the site of the fighting, but until now there has been no other physical evidence. Stirling Council archaeologist Murray Cook said ground-penetrating radar would be used to locate the Roman road on which King Edward II's army marched on Stirling and the famous spike-filled pits that played a crucial role in the outcome. He said pits used to bury the dead might also be found. He said that if the site can be located it would be the first evidence of fighting at the Battle of Bannockburn. Mr Cook, who hopes to follow the survey with a dig next year, said: "The Battle of Bannockburn was the decisive battle in the First War of Scottish Independence, but, aside from a single Edward I penny and an arrowhead, there is very little solid evidence of where the fighting took place. "We do know that the old Roman road played a huge role in Randolph's victory on the first day, however. "Robert the Bruce dug pits on either side of the road to stop the English cavalry deploying on either side of the road and to constrict them to a narrow front. "When they were met by Randolph they had no way around him and were defeated. "Randolph's victory gave the Scots -- seemingly outnumbered and outclassed -- a huge lift. "We know the Roman road is in this area. If we can locate the road and these pits -- or pits of the battlefield dead -- we will have the first real evidence of where this pivotal event took place." The road would show in the survey as a large linear band. The pits, of which there are contemporary accounts, should be in lines next to the road. King Edward arrived at Stirling along the route, along with a vast force of up to 3000 heavy cavalry and 16,000 foot soldiers. The Scots king commanded an army of probably no more than 9000. King Robert himself was involved in the first fighting in the battle after an English knight, Henry de Bohun, spotted him and charged at him with his lance. The Scot manoeuvred to the side and smashed the knight's helmet and head in two with his battle-axe. In the meantime, another English cavalry force under Robert Clifford and Henry de Beaumont skirted the Scottish position to the east and rode towards Stirling, advancing as far as St Ninians. Bruce spotted the manoeuvre and ordered Randolph to intercept. The English horsemen were unable to make any impression on the Scots spearmen, and were defeated. Had Randolph been defeated the Engish would have reached Stirling Castle and there may have been no battle. The following day, however, the Scot's routed the vast English force and forced Edward to flee back to England. Mr Cook said the pits gave the Scots a huge advantage. He said: "This skirmish was of huge significance. If the castle was relieved, all bets were off. "Bruce dug pits to make the enemy come to him on a narrow front. "When Clifford's advance party met Randolph, they could not get at the disciplined Scottish schiltron. The horses would not attack the Scots with their spears and they could not go around them because of the pits." MAROC - Moroccan researchers have discovered two human skeletons which date back to between 6,000 years and 14,000 years ago in a cave in central Morocco, the National Center for Archeology and Heritage said Tuesday in a statement. The bones were found separated by an archaeological layer of about 0.5 meter, the statement said, pointing out, however, that the precise age of the skeletons needs to be confirmed by radioactive dating. The first skeleton, which dates back to between 6,000 years and 8,000 years ago, belongs to an adult man buried in a narrow trench in a sitting position with legs contracted sharply. The second skeleton is of an adult man who was buried on the first man's right side, and is estimated to date back to between 8,000 years and 14,000 years ago. The statement added that the importance of this discovery is to refute the idea of a cultural vacuum between the Neolithic period and the Late Stone Age, between the cultures of human communities dependent on hunting and the first agro-pastoral groups that followed.